Our lives seem to be moving at a faster pace than in the past and we are constantly plugged into our cellphones and electronic devices. Many people are doing multiple things at the same time and we are all distracted by these devices, especially while driving. We have gotten use to do this and refer to it as multitasking. Thank about the last time you were being the wheel of your car (it might have been you or someone in another car). How many people do you see doing something besides focused on driving? There are three types of distractions: Visual, Manual and Cognitive. A cognitive distraction is something that takes your mind of the task at hand. Examples of this could be argument with significant other, issues with family member, work problems, bills, upcoming vacation or some other thing. According to the National Highway Traffic Safety Administration distracted driving claimed 3450 lives in 2016. These seats where preventable if not for the drivers reckless behavior. National Highway Traffic Safety Administration states that 391,000 were injured in car crashes involving distracted drivers in 2015. They also state that approximately 481,000 drivers are using cell phones while they are driving. Teens were the larges age group that National Highway Traffic Safety Administration reported as distracted at the time of fatal crashes. 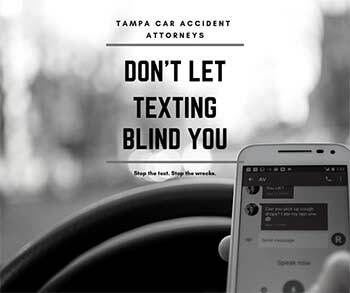 Individual who drive while sending or reading text messages are 23 times more likely to be involved in a car crash than other drivers. A crash typically happens within an average of three seconds after a driver is distracted. Florida law states that “A person may not operate a motor vehicle while manually typing or entering multiple letters, numbers, symbols, or other characters into a wireless communications device or while sending or reading data 1on such a device for the purpose of non-voice interpersonal communication, including, but not limited to, communication methods known as texting, e-mailing, and instant messaging. As used in this section, the term “wireless communications device” means any handheld device used or capable of being used in a handheld manner, that is designed or intended to receive or transmit text or character-based messages, access or store data, or connect to the Internet or any communications service as defined in s. 812.15 and that allows text communications. For the purposes of this paragraph, a motor vehicle that is stationary is not being operated and is not subject to the prohibition in this paragraph. Do not multi task behind the wheel of a car. Many phone manufactures not have added a function that you can turn on that disables your phone while your car is moving. Also many insurance companies have apps for your phone that also disable your phone while the car is in motion. When someone calls the phone they are given messages that while you are driving the phone is not receiving calls or messages. That the driver will be notified of your call or message when the car has stopped. Distracted driver is something that is preventable. In a recent accident in Clearwater a distracted driver hit a pedestrian and left the pedestrian critically injured. There driver stated that they looked at the phone to change the music selection and that is when they struck the pedestrian. Distracted driving accounts for 25% of al motor vehicles crash fatalities. 58% of all teen creates are directly related to distracted driving. Distracted driving is commonly referred to as the “new drunk Driving”. Texting while driving is 6 times more likely to cause an accident than driving under the influence of alcohol is. While the number of drinking and driving fatalities has decreased in teens, the number of traffic fatalities in the age group has not, much attributed to distract driving. The CDC reports that teens who reported frequent texting while driving also proved to be more likely to ride with a driver who’d been drinking, more likely to drink and drive, and less likely to wear a seatbelt. Over 80% of drivers admit to blatantly hazardous behavior while driving, such as changing clothes, steering with a foot, painting nails, or even shaving. Distracted driving is seen as a tricky problem as it’s a temporary one that is hard to proactively predict and catch. 80% of car crashes are attributed to a driver being distracted or not paying attention. Sending or reading a text causes drivers, on average, to take their eyes off the road for 5 seconds. When driving at 55 miles per hour, that means that drivers travel approximately the length of a football field with their eyes closed. 82% of American teens have a cell phone. 52% of these teens note that they talk on the phone while driving and 32% text on the road.